No Wake Zone | Normative Signs: The Poetry of "Ought"
This “No Wake Zone” sign is from Toronto’s Ashbridges Bay park. It is intended to direct boaters to driver slow enough not to cause a wake. Of course, land-lubbers may be confused: am I supposed to sleep here? Is caffeine forbidden? Thanks to Barb Secker for the photo. 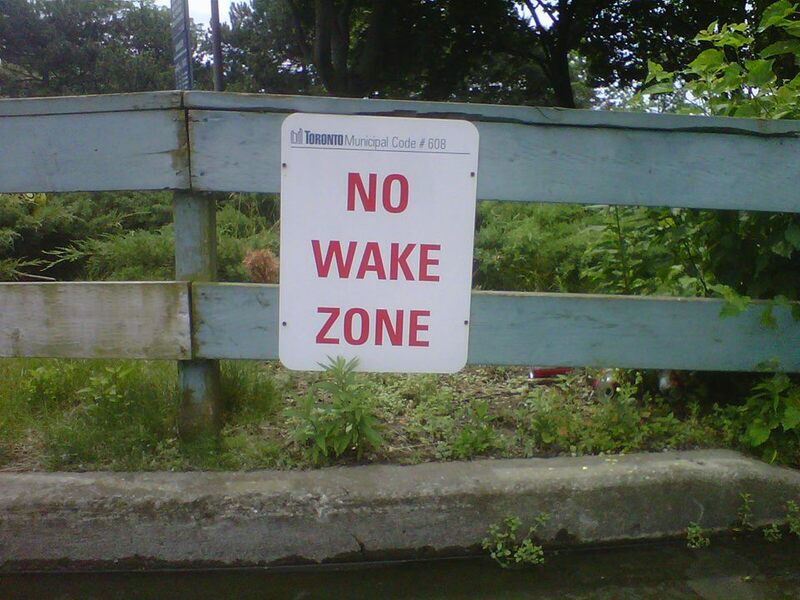 Well, the real problem is a missing hyphen: “No-wake zone” would be more correct. “no” modifies “wake”, not “zone”, so it needs the hyphen. I spend more time adding hyphens to technical documents than I care to think about.